The AH-64 Apache can be considered the most famous attack helicopter in history. It was designed to operate on the front line and to perform anti-tank, anti-helicopter, assault and close support missions in “all weather” conditions and in any operating environments. 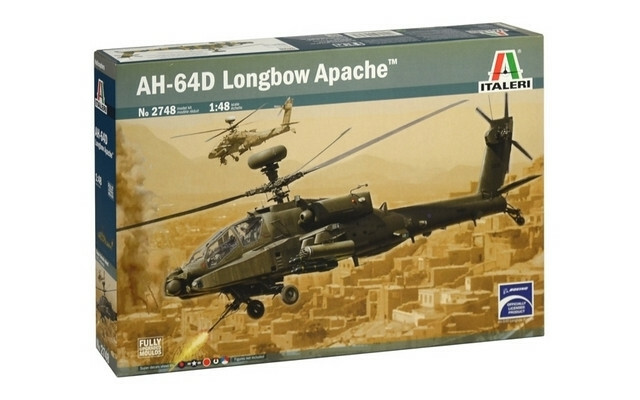 The AH-64D Longbow is the upgraded version with and increased offensive capability and the adoption of advanced target acquisition systems. The “Longbow” is characterized by the AN/APG-78 radar, housed in the radome located above the main rotor. It raised position enables target detection and use of missiles, as the anti-tank Hellfire, while the helicopter is hidden behind hills, trees or buildings and out of enemy sight. The main armament is the 30 mm M230 Chain Gun installed under the cabin. The AH-64D is able to load, in its four pylons on the stub wings, a significant variety of offensive weapons as rockets and missiles.